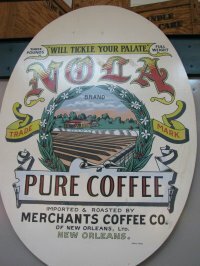 Coffee first came to North America the way of New Orleans back in the mid-1700's. It was successfully cultivated in Martinique about 1720, and the French brought it with them as they began to settle new colonies along the Mississippi. The taste for coffee and chicory was developed by the French during their civil war. It was scarce during those times, and they found that chicory added body and flavor to the brew. The Acadians from Nova Scotia brought this taste and many other french customs (heritage) to Louisiana. Chicory is the root of the endive plant. Endive is a type of lettuce. The root of the plant is roasted and ground. It is added to soften the bitter edge of the dark roasted variety. Chicory is used to make the favorite blend of New Orleanians. It is no unusual thing for a business man to say casually: "Well, let's go and get a cup of brew," as a visitor in his office is making ready to depart. It is a little thing perhaps, this drinking at odd times, but it is very characteristic of the city itself. Men in New Orleans give more thought to the business of living than men in other American cities. . . . I have heard Northern business men complain bitterly about these little interruptions for it or what-not. We may never know if the break was actually invented here in New Orleans, but I believe so. The market has struggled over the last couple of years, but New Orleans brews remains the top selling brands in Louisiana and abroad. There are 4 different New Orleans brand of brew that dominate the market in Louisiana. Community is the most recognizable New Orleans brew on the market. French Market is loved by all New Orleanians. Cafe du Monde invented the "au lait" style. Mello Joy is a cajun brand that is produced in Lafayette Louisiana. Click here to locate all Louisiana Coffees. To Learn more on Louisiana food and Culture. Morning Brew Coffee is a great site dedicated to discount speciality coffee beans, brewers, teas and more! Atoz Coffee Makers where they strive to give helpful advice on many types of coffee makers including Bunn, Keurig, Cuisinart, Braun, Krups, Delonghi, Hamilton Beach, and more. Home Appliance Kitchen Aid is a site designed to help all consumers learn how to save money on kitchen and home-appliance repairs. Valuable money saving information about household appliances, from cookers and refrigerators, air conditioning and dishwashers to microwaves, all the best practical advice on looking after your valuable kitchen aids and equipment. Easy Indian Food Recipes has a good collection of mouthwatering easy Indian Food Recipes !! Enjoy Indian Cooking with these Easy Indian Food Recipes plus great Indian Coffees.